Back to school! September is a time for beginnings, traditionally with youngsters bearing cedar-scented Ticonderoga No. 2’s and new Goldenrod yellow-sheeted tablets beginning new school year in a new grade, with a new teacher. While year-round – or nearly year-round — school means less free time in summer, there is still anticipation of the fresh start a new school year brings. Grant School, covering the square block at the southwest corner of 7th Street and 11th Avenue is Rock Island’s oldest building that has been used continuously as a school. The first Grant School was a 2-½ story frame structure built in 1895 facing 7th Street on the west side of the block between 11th and 12th Avenues. Originally known as Public School No. 9, it served the population of Rock Island that had begun to grow in the area south of 10th Avenue. Although its name was updated in 1897 to honor Ulysses S. Grant, famed Civil War general and later president, it was still a building without other updates, heated only by stoves and lacking electric lights. This old Grant School lasted 16 years and had the dubious honor of being the last frame schoolhouse in Rock Island. In November of 1909, the Board of Education signed a contract with Collins Brothers to build a brand new brick and reinforced concrete school using the design of architect Olof Z. Cervin. On February 17, 1911, dedication ceremonies were held at the new Grant School. Recitations and music were provided by students and others to the 300 in attendance. The theme of the keynote address by Judge C. J. Searle rings as true today: The common (or public) school puts all on an equal basis and gives each an equal opportunity. He then compared the public school to a miniature republic. This undated Real Photo postcard from the Special Collections at Augustana College Library shows the original school building, in the center of the square block. The main entrance, which is framed by unusual notched stone columns, faces the south. The old frame school, which was located at the far right of the postcard view, remained on the site for a time. Although it contained eight classrooms, Grant only had five grades so only five rooms were initially used. Additional grades were phased in a year at a time. The first floor, with a “nice little office” also held a room for principal. In the basement, a large room was convertible into a gym while another room was intended for future manual training. On the east side of the second floor, visible on our postcard, two rooms were separated by a moving wall so a large assembly room could be created. Don’t be surprised if you don’t recognize the postcard schoolhouse. It is still there, visible from a few angles, but largely hidden under at least three additions which take design cues from the older building. Why so many additions? Blame World War II, which brought hundreds to Rock Island to work at Rock Island Arsenal. This created a critical housing shortage which was partly addressed by the construction of an apartment complex, Arsenal Courts, built in 1941 just to the southwest of Grant School. More homes, more students, more classrooms. A federal grant covered nearly half the construction cost of a $132,000 six-classroom addition in 1941 because the expanded school would serve government workers. A decade later, another addition and basement remodeling created three more classrooms and more bathrooms. By 1961 it was time for a new gymnasium, which was built on the south side of the postcard school, right in front of the original main entrance. The historic entrance columns and the stone cornice they support were moved to the center of the north side in one of the new additions, where they can be seen today. The dozens of tiny panes in the huge window above the old entrance, as well as some of the other windows on the front part of the school were simply replaced with bricks. The shaped stone window hoods and the stone quoins trimming the window sides remain. 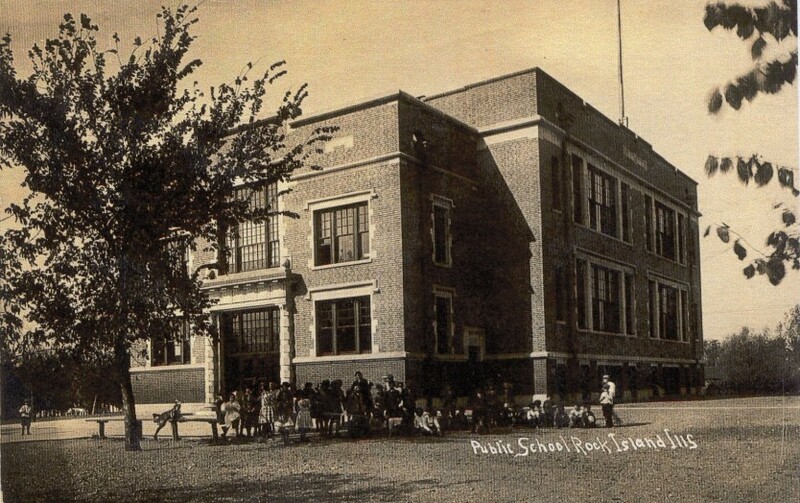 With the postcard picture in hand, it’s easy to identify the original Grant School. The dark-colored textured brick of the base balances the ultra smooth pressed brick and the pale stone bands trimming the upper stories. The classroom additions complement the original building by using stone bases and a vertically-textured brick above. They, too, have stone coping atop their parapet walls. There are still small-paned windows throughout, even in the newer additions, although the older windows have been modified. Notice that the wooden window frames and sashes are painted a dark color on the postcard view. This article, by Diane Oestreich, is slightly modified from the original, which appeared in the Rock Island Argus and Moline Dispatch on September 19, 2004.